Most teachers would agree that making math relevant and engaging is important. Utilizing student interest in a math lesson can turn a good lesson into a great lesson. Moreover, the lesson will be memorable for the student – even after the assessment. An example of this type of lesson can be found here. Over the past year I’ve seen many Twitter posts (and publication articles) regarding how to use Angry Birds in the classroom. I understand that this game can be used for a physics discussion, but since I teach at the elementary level, I often skimmed those types of posts and looked for some type of way to integrate this extremely popular game into my classroom. Even at the elementary level, students are intrigued and can tell me all about the game itself, from strategy to cheat codes. I feel that part of my job is to engage students in meaningful learning. 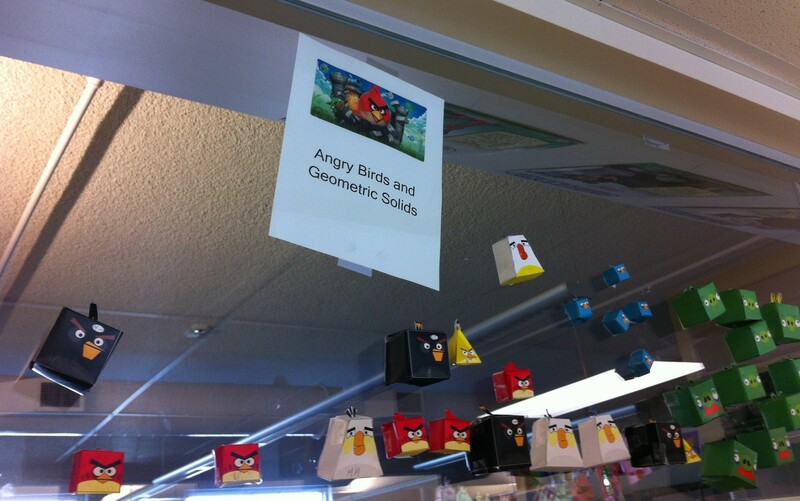 Last weekend I came across a blog that led to this site that shows how Angry Birds can be used to teach geometry concepts at the elementary level. The site even had colorful PDFs that I could print to make this activity realistic. I utilized this activity for my third grade class. 1.) I printed out the PDFs and had my students create all of the different geometric solids. Here are the pdfs (1) (2). 2.) I showed students different types of solids. I also brought out the manipulatives found below. 3.) I then reviewed the following vocabulary words: vertices, faces, edges, and surface area. 5.) Students used scissors and glue sticks to build their particular bird. 6.) Once finished, students were asked to fill out an exit card regarding the amount of edges, vertices, and faces of the particular bird that they created. 7.) The birds were then posted in the classroom. The pictures are below. Next ›Reflection Journals in Math Class? I can already see the birds flying across my classroom. How FUN!!! Thanks for the GREAT find! Thanks for the comment. It was definitely a memorable learning experience and worth sharing. I really want to do this next week and I tried to download the PDF but it’s not there. Is there any other place to find it?? It looks like the original owner of the pdf has deactivated the links. I’ll let you know if I find another copy. Thanks so much for the quick reply! After some searching on Google, I found the PDF versions to every angry bird! I’m sooooo excited to use this on Monday. I think the kids will really like it. I’m going to make my exit ticket right now!